The stunning popularity of the "New Atheist" movement-whose most famous spokesmen include Richard Dawkins, Sam Harris, and the late Christopher Hitchens-speaks to both the growing ranks of atheists as well as their vehement disdain for religion. 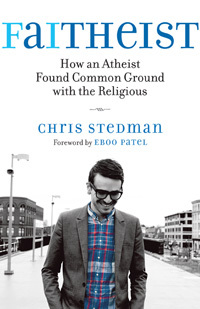 In Faitheist, Chris Stedman challenges the orthodoxies of this movement and makes a passionate argument that atheists should learn to respect religious identity while remaining secular. Stedman draws on his work organizing interfaith and secular communities, his academic study of religion, and his experiences as a former born-again Christian who struggled with his homosexuality and became, for a time, a New Atheist-until he saw its shortcomings. As someone who has stood on both sides of the divide, Stedman is uniquely positioned to present a way for atheists and the religious to find common ground.